During the annual Catholic celebration of Lent, the ancient art of palm weaving has a revival. 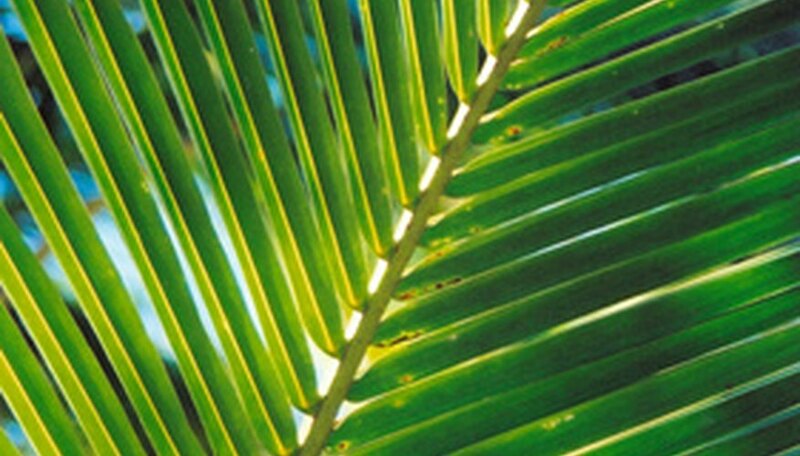 At church services on Palm Sunday, church parishioners receive palm leaves from priests. Talented palm weavers manipulate these palm leaves into religious icons like roses or crosses. Once blessed by the church, these elegant creations become decorations in homes. This religious craft symbolizes the palm-strewn path that Jesus walked along when entering Jerusalem. Many catholic families teach this time-honored tradition to their children and grandchildren. Weaving a rose out of a palm tree leaves requires patience and a bit of practice. Cut two palm leaves into identical lengths and widths with scissors. Place the palm leaves on a flat surface such as a table into an “L” formation. Leave approximately 1 inch of the horizontal palm leaf hanging out beyond the corner where the two leaves meet. Fold the 1-inch tab of the horizontal palm leaf over the end of the vertical leaf where the two leaves mesh. Pick up the vertical leaf and place it behind the horizontal leaf, then switch leaves and place the horizontal leaf in front of the vertical leaf. Repeat this process six times; on the fifth time around, tuck the vertical leaf underneath the horizontal one. Secure the foundation of the rose by sliding the horizontal leaf beneath the vertical leaf. Begin at the right and fold the horizontal palm leaf to create a medium-sized loop. Thread the remaining portion of the palm under the top part of the palm. Form a loop with the excess section of palm leaf under the top of the palm. Tuck the leftover piece of palm beneath the first loop that you made; the horizontal palm leaf should resemble a bow. Form a medium-sized loop with the vertical palm leaf. Slip the unused segment behind the back of the leaf. Make the last loop by placing the end of the vertical leaf underneath the formation; the palm leaves should look like a ribbon cross with a tail, or a four-leaf clover. Tuck the right loop into the left loop to form the interior of the rose. Put the top loop over the right and left loops to create the bud of the rose. Position the bottom loop on top of the other loops. Trim off the extra palm leaves with scissors, or tuck them under the rose bud. Ensure that the palm leaves stay dry to keep the leaves malleable. The palm leaves are reusable, so start over if necessary.